Some say that John Lennon was the reporter-on-duty for the Beatles. For the most part, his songs do have that matter-of-fact quality, often commenting on the news of the day. Or of his life, for that matter, and always taking a lot of artistic liberties, of course. We’re not getting into the slippery slope of ancient rock music critique, for most of these stories have been percolating around for over 40 years. They’re part of the lore and mystique about the Beatles and, we promise, that’s the last word ending in ‘QUE’ we’ll be using on this post. But before we forget, of course, these are outstanding songs, and the passage of time has had no effect on them. Like at least an arguably 100 million Americans, and countless around the world, I too am embarrassed and horrified by the ghastly, and tasteless, Donald Trump for President circus. When, and how, will it all end? To be honest, though, I never liked the guy. But there was a moment, and it’s no wonder that it was one of the darkest in recent history, when I agreed with this ogre. Who for all I know, would likely squash me like a Manhattan cockroach, if given a chance, or care about it. Fortunately we never met. Hey, for all it’s worth, we don’t really know he’s as rich as he boasts, and compared to all other lies he’s been telling, some uglier than others but still, all lies, the claim of being a billionaire may be reality only under his fading orangutan-orange hair. I’m not being original here. Most New Yorkers have hated Trump since the time the Twin Towers were being built, and his daddy Fred was giving him the keys to the family loot. And if you didn’t dislike him before, you do now with his gag-inducing media coverage. Sure, Woody Guthrie wrote ‘Old Man Trump,’ about his slumlord father. But in these witless times, we can see not even Bob Dylan, for one, coming up with something, even if full of contempt, that wouldn’t be misappropriated and wind up adding to the cult of Don. The man has made a point in appearing vile through the years even in photo-ops, and while adding his name to the facade of mediocre buildings and shady casinos, he’s also been pictured next to quite a morally questionable bunch too. Just Google it. But there was that moment, and again, I’m not alone in it, when reality was so punishing that at least briefly, bent everyone’s perception of it. And I agreed with the creep. That was 9/11, but hold it before hating me for linking it with his name. For the generation that grew up during the cultural turmoil of the 1960s, a lot of what it was determined to break free from was the placidity, conformity, and political conservatism of the U.S. in the 1950s. The rock’n’roll explosion only made that rupture more visible. But there was a world that preceded it, marked by two wars, where ideological conflict, social hardship, and technological impact, helped shape a musical tradition that proved itself as one of the greatest cultural achievements of our era: the American Standards. 2015 may turn out to be a landmark year, as milestone anniversaries are bound to shed light on such a rich tradition and its main protagonists. Billie Holiday, Billy Strayhorn, and Frank Sinatra, are just but three of such luminaries who would’ve been 100 this year. And so would Muddy Waters, Willie Dixon, and Les Paul, all giants on their own, whose association with early country, blues, and jazz insert them, permanently, into the mainstream of American music. But it was the deceptively lowly popular song format what helped usher the Standards into an art form. To many, the addition of Eastern European Jewish melodies, the Klezmer and other Gipsy traditions, to rhythms and syncopations of African tribal beats, converging for two centuries to the U.S., was what created the two main streams of American music, Blues and Jazz. The Great American Songbook is a worthy heir to those two. It was also a rare combination of a few generations of extremely talented composers and musicians, with race and immigrant blood running in their veins, that took advantage of a nascent record industry, and offered the perfect antidote to the bleakness and economic despair of the early 1900s in the just industrialized world. Armed conflicts helped spread that sense of urgency – French songbird Édith Piaf would also be 100 this year – with vaudeville, music hall, variety theater, and a general cultural miscegenation of sorts, all fit snugly into 3-minute songs that encapsulated a badly needed sense of hope for the era. Even though such gems were not exclusively American, it was in the U.S. that the genre thrived and produced some of the most memorable and enduring melodies and lyrics ever written in English. Then, they were supposed to be about escapism and romance. Now, they can be enjoyed for their distilled wisdom and artistry. Which is odd, since those Tin Pan Alley composers were working overtime to meet an inflated demand for hits. But what their produced then, under pressure, now betrays none of the rush with which they were writing them at that time; the craftsmanship of some of these songs still has few peers compared with much of those that came after. The songwriters created an alternative universe, where longing, redemption, and the allure of romance is always within reach, even when they refuse to concede the singer the grace of happiness and fulfillment. At times, the world these songs promise or allude to was the only world worth living for, even if only for a few minutes. Lovers who wished to be reunited with their dears, warriors whose losses made them cry silently for the first time, common people who saw their world coming apart right in front of their eyes, found comfort in these lyrics that invite them to dance, to dream, and to remain hopeful for another shot at life. The other day, when 400,000 people marched in front of your New York City home, I couldn’t help it but think how much you would’ve enjoyed seeing so many taking the streets for a cause – this time to fight Climate Change – just like you, marching against the war. It also helped that it was the International Peace Day, but what was particularly poignant about Sept. 21st was to realize that many in the crowd had probably been there before, on a cold December night of 1980, to mourn your assassination on the steps of the Dakota building. You would’ve been 74 today, and almost certainly, equally as engaged in progressive causes as you were some forty years ago. And that’s what makes us so sad, that we can no longer hear your voice, and how much the crowd misses the guidance of people like you, and Pete Seeger, to name a like-minded artist. The fact is, even at that time, such head-first dive into political activism and explicit protesting was not what many musicians considered the best way to go about seeking change. Bob Dylan comes to mind as another influential star who, like many of your contemporaries, was just not into singing songs, carrying slogans, and parading for peace. But while they may have been a tad too concerned about the impact that an explicit anti-establishment attitude would’ve had on their careers, you were simply not in the same level of showbiz calculation. To you, it seemed only natural to be part of what the people in the streets were protesting about, warts and criticism notwithstanding. And there were a lot of put-downs about your over-exposure to the media, your peace and bed-in campaigns, your stunts which, to a small segment of the intelligentsia, were perceived as opportunistic and self-promoting. Never mind that your efforts, as off-the-kilt as they were, became somewhat effective. In perspective, all that fiery anti-war poster and newspaper ad placing, your tireless advocating and support of people such as Angela Davis, John Sinclair, Jerry Rubin, Abbie Hoffman, and others, are now an inextricably part of the historical record about mass movements that helped put an end to the Vietnam War. 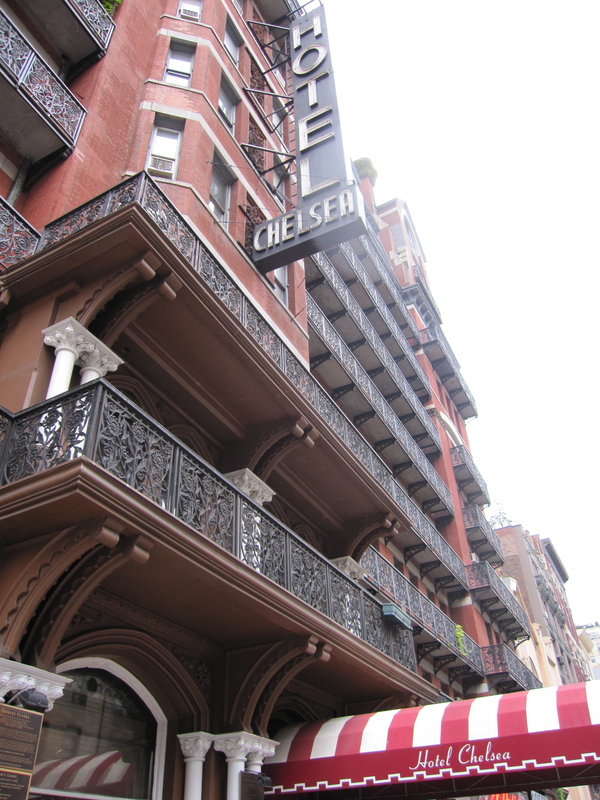 Bob Dylan and Leonard Cohen slept there. So did Andy Warhol. Robert Mapplethorpe and Quentin Crisp had a few loud arguments. Arthur Miller was once heard screaming on the first floor, while Eugene O’Neill and Charles Bukosvski used to get drunk but kept to themselves. Unlike Sid Vicious, who stabbed his girlfriend to death in his room, and passed out waiting for a drug delivery.